Viewing topic "Artist 8.5 audio mixdown cpu overload"
I have somehow, successfully been able to get Cubase Artist 8.5 to work with my XF8 (and XS6, S90ES)....but just XF8 (USB only) with VST at this time....and add vocals through my Tascam US-144. I have Win 10-64 bit, an AMD quad core 925 processor running at 2.8 GHz, and 8 megs of ram. I tried to do an “audio mixdown” of one piano track and the vocal track, thinking this would render into one file. I keep getting a “CPU has encountered an overload” within a measure or two of starting the mixdown. Before I even get to the audio. Was thinking “maybe too many plugins” but, using the windows cpu monitor, as I start the mixdown, I show it never getting over 35% of cpu power and 35% of memory. I tried removing plugins....no fix. I went to Steinberg and “optimized” my old puter for Cubase by shutting off power saving stuff. (Couldn’t find much help in the BIOS though). My workaround has been to play the project and tape off of the tape output of the mixer I use with a little digital recorder. I still am confused as to how to connect everything properly. I do not run the main outputs of the XF back into the computer audio (Tascam 144), just to a mixer. I do have the VSTi setup showing the channel one (only) input from the Tascam analog left and right. That was how I got the vocals in there. Everything, including the plugins for the vocals works, and the editor communicates fine with the XF. Just don’t understand the mixdown thing. I’d suggest that it’s a bug or something that ‘might’ be fixed the next time you reformat and reinstall, but I’d be interested in knowing what plugins are running when you get the error. You might also like to try doing an audio mixdown in a totally different project with different tracks and plugins, just to see if you get the same result. You said you tried removing some plugins, but have you tried removing all of them one by one, because it could be a bug with one particular plugin. You shouldn’t have any problems rendering a mix of many tracks and plugins with the machine spec you’ve mentioned. It’s early and pre-coffee here, so I may have missed something in your original post but.. If your XF’s outs doesn’t go into the mixer, I assume that that you are getting its audio over USB? It would maybe be good to check which output channels you are trying to export as a first step, since you don’t seem to have any problems playing your project back. First, thanks for the replies. Phil, doubt I will be reformatting and reinstalling. I am just a small time hacker using Cubase to help me do simple midi files for my daughter and my duo to change up the sound of just me on piano for every song. I AM though, hoping to do our next CD here at home. The last (our first) was done in a private project studio by a kind friend, and I think I can do it just as well and keep some sort of creative control over it and then send it out to be mastered. ZPink, I have a mixer that, currently, is not attached to the computer via USB. Things were confusing enough with computer speakers (cheap onboard soundcard), the Tascam, and then adding a USB mixer with no proprietary drivers (Peavey seems to just use standard USB driver). The Tascam 144 is a second input device and I am using it USB and it’s drivers to interface with the computer and I monitor it’s output out to the first mixer. As you recall, no audio comes out of the XF with just USB, only midi (and I don’t have the firewire option installed). I will look up the Audio4all and read up. Anyway, the playback is fine and I can record off the main mixer in real time. Just want to learn this stuff better. Am willing to invest in a better interface (and maybe go the firewire route?) One day have a dedicated music computer setup. If you are going to get your piano line from your XF into a mixdown/export with a vocal track already recorded in Cubase, the XF’s sound must be coming in on an input, so what happens if you just add an audio track to first record this input? If that works without issues, you should be able to export the mixdown of these two tracks and no need to do it in real time (as you will have to do when any external gear is involved). If you can play back without any crackles/pops or other artefacts, your drivers and buffer-sizes etc. should be OK. Are you sure that you’re trying to export the correct bus? Normally ‘main’. Sorry if I’m only confusing things more since I don’t really understand your setup! Thanks for the additional info BeeRad. You appear to be working in quite an unusual way, but hey, very few people post on Motifator about interfaces and admit they’d like to learn more. Usually it’s something like “I just bought an audio interface, I know how to use Word 98, so it follows that I should easily be able to record beautiful sounding audio with my interface, which is just another facet of information technology, as I see it”. So you’re already off to a good start on your quest. From what you’ve already given us, the way you use your gear is not completely clear, but I’ll give you a very basic idea of how I’d use what you have and maybe you might be able to take something from it. You have a Tascam US-144, a Motif XF and Cubase 8.5 Artist, from what I can tell? This is all you should need, other than some kind of amplification so you can hear the output of your Tascam US-144 (not your XF and not your computer’s sound card) Your XF will be heard through your Tascam US-144. A USB cable between the Tascam US-144 and your computer. The Tascam’s LINE OUT’s will go to your amp and/or speakers. 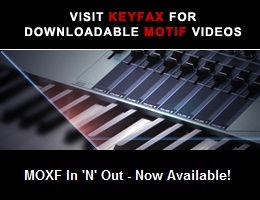 Finally, your Motif XF’s left and right analogue outputs, should be cabled to your Tascam US-144’s LINE INPUTS. As for MIDI, I expect that you will either be using MIDI over USB from your XF to your computer OR you are using regular 5 pin DIN MIDI cables from your XF MIDI ports to your Tascam’s MIDI ports. If you do this, you have a perfectly serviceable music computer set up, and you will not need to change the cabling at any point. The method I would use is to make sure I end up with separate audio tracks for music and vocals in the same project before attempting to export it all as a mix. This would mean recording all musical parts from the XF first and then recording vocals using those music parts as your guide. Presumably you would do that with a MIC connected to your Tascam’s mic input. When I am happy with everything, I will bounce my mix to a stereo file using the export/mixdown function in Cubase. When doing so, I don’t even need the Motif XF powered on at all, because I captured all the audio I needed from it earlier. The mixdown will provide me with a stereo WAV file that I can send to a mastering engineer. Even if you have prerecorded vocals, or prerecorded MIDI files, the same set up will apply and the method will be a little bit more complicated using MIDI to keep your parts in time. Hope that helps or gets you thinking, because the chances are that trying to render your audio and mix processing whilst capturing audio in real time, as you are currently doing, all at the same time, is causing your computer problems. It’s only a capsule summary of a basic way to work, but it may help you straighten out anything which might have been panicking your computer into giving you that error, if it isn’t plugin related. Phil, and Zpink, I have before cabled the setup as you, Phil, have suggested… but changed it to record vocals from my daughter live into Cbase thru the Tascam. This is the only thing going thru the tascam (usb’d to puter). I then used midi via usb from XF directly to computer (while main outputs of Xf went to speakers for her to hear and sing to live while I play). This allowed me to capture a live performance for both of us, with no audio coming from XF into a track, just midi that I can fix if I hit a clunker. (Which I do) This works great! and plays back great with plugins etc. I am thinking my problem is I am trying to apparently mixdown a midi file (one track) combined with an audio file.......hence the error! Once I did try to plug the XF outputs into the tascam for a playback of the midi file to record it into cubase as audio (would this be like a “bounce”?) but can’t seem to get it to work right but think I am on the right track. The input ports from the Tascam are automatically taken as audio for the XF VST editor (Apparently this is to record the XF mains as audio when I connect the XF outputs to the Tascam, instead of directly to the studio speakers?) and when I added the vocal track I had to steal them for the mono input bus to get it to show up in Cbase. I also couldn’t get the vocals to show up and record in the track unless I clicked the “monitor” button on the track........so much confusion but that’s the best way to learn. I doubt I will be able to get time with my gear for the next couple of days but will report back. But I think my mistake is trying to mixdown a midi track(s). How stupid of me! As a Christmas present, I am going to post in the song forum, the quick, one take song I was messing with. It ain’t perfect, but one only one take before her daughter (aged 18 months, woke up from her nap!) Excuse the tentative piano. My daughter’s voice is often compared with Nora Jones. Are the piano and vocal tracks already Cubase audio tracks? I don’t think you can do real time rendering with MIDI tracks. Unfortunately BeeRad, if you always do what you’ve always done, you’ll always get what you’ve always got and when you decide to take responsibly for engineering your own music without involving anyone else, and you record something more complicated, that’s when it will hit you the hardest. You’re experiencing very normal things when you have to use a mono input and enable the monitor function to hear your vocal mic. Using the monitor function actually suggests to me that your vocal audio probably isn’t even being recorded to your hard disk as a separate track of its own, and that you’re trying to process and render it with everything else, all at once, on the fly. If you are doing something similar to starting everything off and then getting your singer to start singing because you’ve left the vocal track monitoring the mic input, then I’m not surprised you are encountering problems. That would be a completely incorrect and likely problematic way of using your gear. You wouldn’t be doing something like that whilst trying to do an audio mixdown, as well, would you?